While some people like to buy cognitive enhancing pills that contain a variety of ingredients, others prefer relying on a single Racetam or Nootropic simply because it provides higher potency. Aniracetam belongs to the Racetam family and has been found to be 5x more potent than Piracetam. The compound was first created in the 1970’s by a Swiss Pharmaceutical company called Hoffman-La Roche. Ever since then, Aniracetam has been studied thoroughly by scientists who believe in the compound’s memory enhancing capabilities. While researchers have been testing whether Aniracetam could effectively defend against neural diseases such as Alzheimer’s or dementia, the drug has also been proven to have short-term benefits. These benefits include memory improvement, better synaptic plasticity, and enhanced mood. Let’s take a closer look at how Aniracetam works and each of the benefits it may provide. Aniracetam works very effectively because it is capable of crossing the blood-brain barrier within 20-30 minutes. Once it does, it begins to work with the neurotransmitter acetylcholine. Acetylcholine is responsible for imperative cognitive functions such as learning, memory, and attention span. Aniracetam binds to acetylcholine receptors and prevents desensitization, which allows the neurotransmitters to have a greater influence. The drug also increases the release of acetylcholine, which provides a greater drive to learn and better formation of memories. Aniracetam stimulates the AMPA and kainate receptors – both involved in the communication between synapses of nerves. By binding to these receptors, synapse formation and transmission are improved. AMPA receptors are also involved when we form new memories, so Aniracetam increases the chance that we will remember new information or experiences. Another great aspect of Aniracetam is that it is capable of improving our mood. It does this by working with the neurotransmitters dopamine and serotonin. Dopamine is known as the “feel-good” chemical and serotonin is responsible for sleep regulation and calmness. Aniracetam maintains the balance of these neurotransmitters, which leaves us feeling calmer and more content. When our anxiety levels are lowered, our brains are more capable of processing information and learning. Daily dose of Aniracetam should stay between 600 – 5,000mg. While Aniracetam is available in powder form, please be cautious that it tastes quite bitter. If you are sensitive to bitter tastes, then perhaps taking it in capsule form would be a better option. “If you have done any research on aniracetam (or piracetam or oxiracetam) then you’ve probably read some anecdotes about how amazing this supplement is. It sounds almost too good to be true. I feel VERY chilled out. Peak Nootropics sells 50 g of Aniracetam in powder form for $17.99. Please be aware of the product’s manufacturer if you decide to purchase from an unknown source. Aniracetam is a well-known compound that is capable of enhancing memory and improving mood. 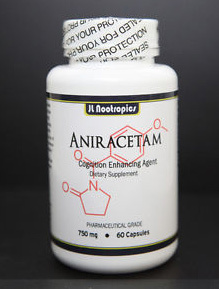 While many people prefer Aniracetam to Noopept or Piracetam, we recommend that you give each one a try in order to see which works best for your needs.